We’ve covered this topic several different ways in the past. But we need to return to this important topic of how to prevent type 2 diabetes naturally. Almost 50% of the adult population of the US has pre-diabetes (sometimes called metabolic syndrome. We’re eating ourselves into a very difficult situation and a part of why we’re here is that we believe as our doctors do that there’s nothing we can do about it. 20% of us are obese – a common symptom that goes with the pre-diabetic condition and we also think that is inevitable – I mean we have a vague feeling that our obesity is something that doesn’t respond to just dieting and exercise but we feel helpless to know how to do anything but give in. There are a number of things we control that can give us access to reversing type 2 diabetes, but we first have to realize that high blood sugar is not a cause but a symptom. and the treatment – insulin – are simply treating the symptom and not the real cause. Change your approach to treating the cause and you’ll find that your need for insulin – if you are currently on insulin you need to continue to follow your doctors instructions – will go away. Sun Exposure and Exercise – give yourself time in the sun everyday. Your body was made to use sunlight to activate hormones that your body needs to function normally. Take a walk even if you need to keep it short – do something that give you some easy exercise outside where you can get some sun. Start small and work your way up to 30 minutes or an hour a day. You’ll start to feel the difference almost immediately. Change Your Diet to Dramatically Reduce Carbohydrates – carbs are the culprit and your enemy in your road back to functioning normally. You can get some free help by tracking your daily diet – use this free website to start tracking your diet today. Increase Your Intake of Fish Low in Mercury – Omega 3 is a very important animal-based fat for pre-diabetics and diabetics. Fish like wild-caught Alaskan sockeye salmon, sardines, anchovies, herring and fish roe are good sources of low mercury fish if they’re not farm-raised and are sourced from cold waters. Although it is required that you be “choosy” about the fish you eat, with some study and some searching around you should be able to find a source for what you want. You can also supplement with Omega 3 but in that case you also need to concern yourself with sources that also avoid Mercury in their fish sources. Increase Your Intake of Seeds – I like sunflower and pumpkin seeds and eat a lot in my salads. These are a good source of magnesium and magnesium even from supplements will help you to find your way back from diabetes. Increase Your Intake of Good Fats – Everyone tries to peddle the same old “wisdom” that came to use in the 50s along with the food pyramid. These sources of wisdom have been proven wrong by massive numbers of scientific studies over the past 20 years. It’s amazing how long real scientific evidence takes to find its way into our mainstream knowledge. I credit the food companies for part of this because their products were formulated for a time that has long passed but they would like to keep feeding us the same thing rather than suffer the expense of changing. I also credit the pharmaceutical companies – they own a significant interest in the seeds we’er planting that are a big part of the problem and aside from that they get paid for selling us drugs as long as we keep getting sicker. Increase your intake of avocados, along with the use of olive oil and coconut oil – all very healthy sources of fats that you need in your diet. Increase Your Intake of Fiber – Especially fiber from whole foods. I like to steam cauliflower, broccoli, brussels sprouts, cabbage, green beans and artichokes – I only steam them just enough to heat and soften them but not so much that they get too hot or soft – they have less nutritional value the longer you cook them. Try to get 2-3 servings of these per meal including breakfast. Almonds also have a fair amount of fiber and are good raw. I also eat a fair amount of beans – black beans, pinto beans, and lentils. I try to get these organic and non-GMO as a rule. I also recommend raw walnuts. Change Your Treats – Use organic strawberries as a treat along with black berries and blue berries. Minimize Dairy – Naturally this is the one that gets the most “push back” because there are mixed blessings with dairy. On the one hand, most dairy is comes from feedlots and is heavily contaminated with GMO (something you’re almost certainly allergic to) and antibiotics and hormones. Our dairy industry just can’t give us anything edible but if you can find a source for grass-fed milk and yogurt that is free of antibiotics, then you can keep dairy in your diet as long as you’re making progress on your primary objective. 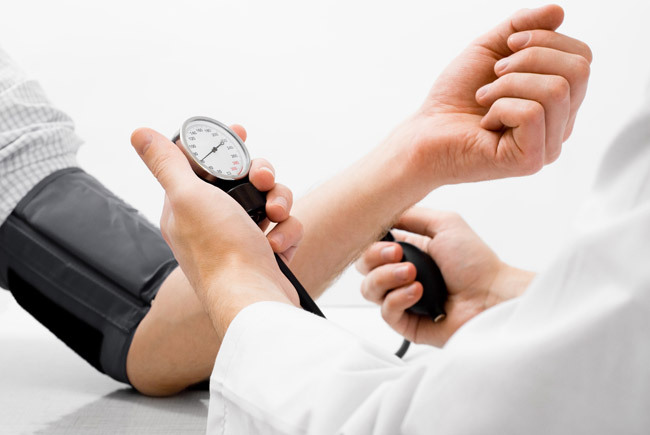 If you’re suffering from dizziness, headaches, leg or muscle pains, blurred vision, food cravings, increased hunger, increased thirst, sores or cut that won’t heal, frequent urination, then you’re probably due for a doctor visit and a blood test. If you’ve already been diagnosed as pre-diabetic then the most important thing is to realize that you have the power to step away from that threshold and reverse type 2 diabetes. If you’ve been reading this blog very long, you’ve probably already become familiar with the role of inflammation in chronic disease. It’s the ultimate cause of everything that happens to us over time including diabetes 2, heart disease, obesity, Alzheimers, MS, and more. And it turns out the #1 root cause of inflammation in older folks is dental issues including root canals, mercury or amalgam fillings, gum infections, and all other such related ailments. It’s not the dentists fault. They’re doing everything that technology has given them to work with. But I do think they blame themselves in some way – how else can you explain that the suicide rate for dentists is higher than any other profession? So if you have any of these dental issues, I recommend you seriously consider what it would take to permanently solve them. If you have a root canal, have that tooth removed whether you can afford a bridge or not, it’s not about cosmetics, it’s about survival and living a life worth living. And if you have mercury fillings, start getting quotes on removal. The consequences as we get older are just too serious to ignore. And if you just have bad teeth and gums, it’s time to start worrying about more than just your bad looks and bad breath – those bacteria you’re collecting in your mouth can put you into the hospital. 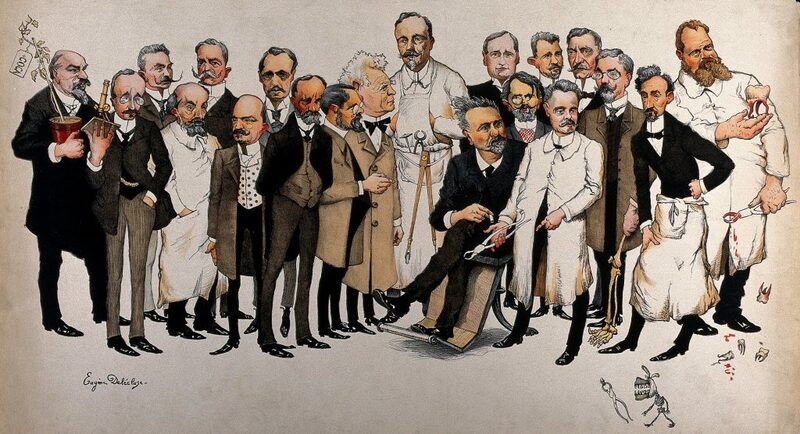 It may be that the Charley Horse got its name in the 1880s from a baseball pitcher who had leg cramps on the field. Others say it was named after a lame horse “Charley” that existed at the ball park as well. Regardless of where it originated, many people as we get older suffer from leg cramps at night and we wonder where they come from and how to stop them. The consensus of opinions is that there can be several common causes but since this blog is about health over 70, I’ll focus on causes that are most common to us and not to olympic athletes. mineral deficiencies – potassium, calcium, and magnesium are often quoted as the most important minerals and mineral deficiencies related to leg cramps. dehydration – too little intake of fluids is a very common problem cited as we get older. With reduced activity, it’s easier for us to neglect drinking enough water. poor circulation and muscle fatigue – also a common problem – we neglect to get even a minimum amount of exercise to encourage better circulation. If you wake up with a leg cramp, here are some suggestions. stretch – most cramps are in the calf muscle so gently stretch your calf by pulling your toes toward you – or if you can’t reach your toes, place some weight on your foot and lean forward against a table or something heavy until you feel a slight stretch of the calf muscle. soak – put some epsom salts in a bath and soak you leg in warm water and epsom salts. What to Do for Prevention? mineral deficiencies – take a daily supplement including potassium, calcium, and magnesium. Too much calcium reduces the effectiveness of magnesium so any calcium supplement you take should include magnesium. Green leafy vegetables have these minerals so a daily salad would include romaine lettuce, spinach, kale, carrots, and celery. A daily “green drink” could also supply these minerals. dehydration – always have a water bottle in your hand everywhere you go and keep sipping it constantly until it becomes a habit. Set objectives to finish a bottle before breakfast, lunch, and dinner – challenge yourself to drink until your urine is consistently light yellow or clear. Don’t use sodas or fruit juices as a substitute for water – they have too much sugar and will cause inflammation that you don’t need so just focus on filtered pure water instead. poor circulation and muscle fatigue – when you try to do too much exercise you fail and end up doing nothing at all so set your sites on a short walk everyday and make it a routine that you do without fail every day even if at the start you’re only doing 10 minutes. Once you’ve made it a habit you can expand to 15 minutes or 20 minutes but don’t overdo it – if your muscles are sore then take it slow and keep doing it without overdoing. The result of daily exercise of the legs can be very beneficial for this problem. Here are some recommendations on supplements that I have used. When I start to feel legs cramps coming I automatically step up my magnesium and that does it every time so I’ve got my cures down. I take a daily liquid calcium with magnesium as shown below. 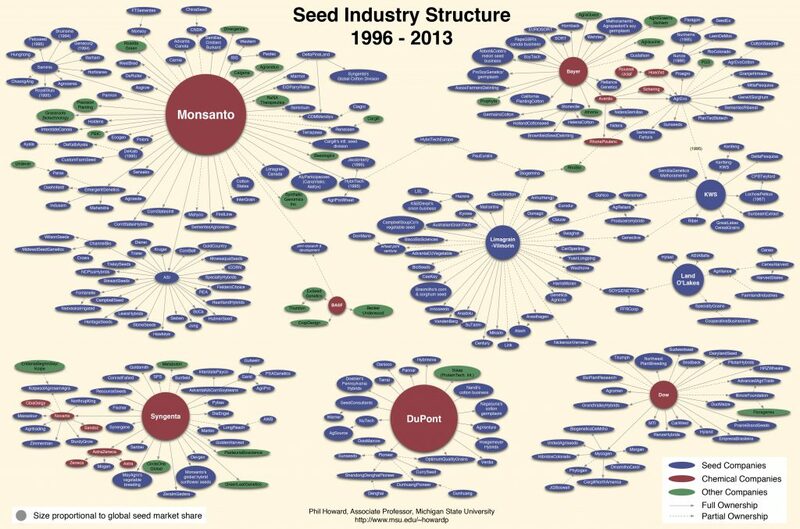 I think all of us hate reading about Monsanto, DuPont, and etc. because the news is so over-whelming. Most people are depressed and feel powerless in the face of how these companies control our food supply and further control our government and the FDA when it comes to poisoning that food supply. But here are two very comprehensive articles that I believe are worth passing on no matter how depressing. It’s all of the chemical processes in your body that keep you functioning. It includes those processes that digest and break down your food and those that synthesize the various things your body needs to remain healthy. Does Slow Metabolism Lead to Weight Gain? Not really. The scientific evidence shows that weight gain has more to do with what you eat and how you exercise. So in some ways the idea that you gained weight because you have a slow metabolism is a myth. A slow metabolism may have some subtle symptoms generally associated with not converting your food to energy as quickly as you need it. What Kind of Things Slow Your Metabolism? There are a number of common things that serve to slow your normal metabolic rate. Your genes – you’re predisposed to a slower metabolic rate. Hormones – stress and lack of sleep put your hormones out of balance and slow your metabolic rate. Strict diets – a diet sends a message to the body to slow down and store fat. Trendy salts without iodine – some things aren’t as good for you as they’re cracked up to be. Not enough water – dehydration tells the body to slow down and conserve water. Caffeine – you may feel like your metabolism is speeding up but that’s adrenalin and not metabolism. Not enough calcium – a shortage of an essential micronutrient. Thermostat too high – being too warm when you’re overweight can create the wrong reaction. Taking a cold walk outdoors if available is a good recipe for cooling down. Medications – by in large these will always slow your metabolic rate. Foods – the wrong kinds of foods – salt, sugar, carbs, can slow your metabolism. It turns out your body was made to run on something called “Ketones” – a type of fat that hangs out in the blood stream, rather than glucose – the by-product of eating sugar and foods high in sugar or sucrose. Carbohydrates are one of the foods that convert faster to sugar and glucose than anything else in our diet. It funny to note that our diet wasn’t so full of carbs several hundred years ago. Many people attribute the most dramatic change as when the US adopted the food pyramid. And further, many of the modern diseases such as Alzheimers, diabetes, heart disease, and more, only become prevalent during this century as well. Basically the strategy is to lose the foods that slow you down and substitute foods that can speed you up. Converting your body and especially your brain from glucose-based metabolism back to fat or ketone-based metabolism…yes, BACK, because the human body was originally designed to operate on Ketones. Operating on glucose is an unnatural act. And it’s side affects are all of the symptoms you see every day – more inflammation that generally affects your organs and brain – chronic inflammation that eventually results in your weakest bodily system fails – whether it’s the brain and dementia or Alzheimers, or your heart, or pancreas with type 2 diabetes, and auto-immune and a whole host of non-communicable chronic diseases. So you first lose the carbs and next you substitute more healthy fats. Start eating avocados and use avocado oil for cooking. Start using olive oil on your salads instead of dressing with apple cider vinegar. And start putting coconut oil in the form of XCT Oil or MCT Oil on everything you eat – it’s tasteless so you can use it freely. Your liver will immediately start metabolizing those Medium Chain Triglycerides and you’ll start to feel immediate changes in clarity, appetite, energy, and more. Here are some general links to searches for all of your choices on Amazon. If you’ve received a lab test showing levels over 150, chances are you doctor has talked to you about diet. 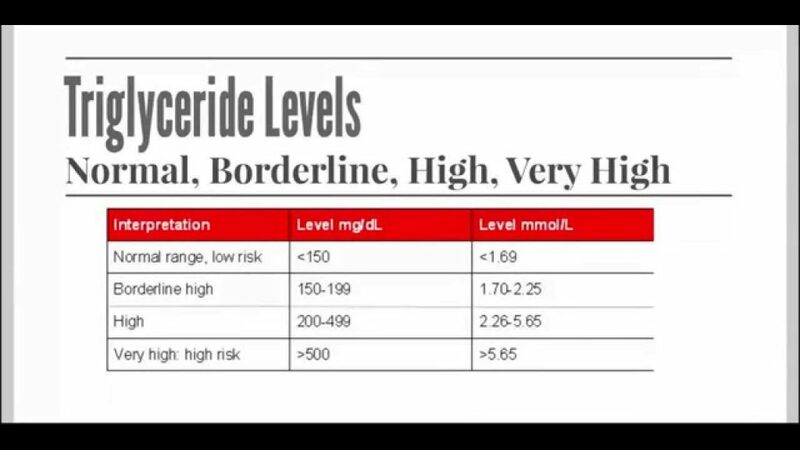 But diet is only one way to address high triglycerides. Triglycerides are how you body converts what you eat to a type of fat or lipid that circulates in your blood stream. If Triglycerides are too high, then there’s too much fat circulating and that tends to deposit itself anywhere convenient – your fat cells, you blood veins (it similar to cholesterol another fat lipid created by your body primarily to repair damage and rebuild cells). Where traditional medicine goes wrong? Not that this is bad advice but it just rarely works, and is only a part of the solution. Rather than purely trying to consume fewer calories, you might consider changing a number of factors that contribute to high triglycerides and generally are indicative of metabolic syndrome – a cluster of symptoms that indicate your health is headed in the wrong direction – toward type 2 diabetes. So why not take a comprehensive approach that includes exercise, dieting, supplements, and do something that is sustainable which most dieting or exercise is not? Just eating less is not generally a sustainable approach. Sure you can cut calories through will power for a while, but that generally just doesn’t last. Better to choose different and better foods where you can actually eat more but get less of the foods that cause the problem. Consider the following changes any one of which could significantly impact your condition in a very positive manner. Reduce or eliminate grain consumption – in other words, get off of anything made of flour – breads, cakes, pies, cookies, rolls, cereals, etc. Grains turns to sugar faster than sugar turns to sugar and in your body and bloodstream grains are a primary fuel for too many triglycerides. Reduce or eliminate dairy. That includes milk, milk products, packaged products with diary, cheese, cream, etc. If you have to have dairy then make sure it is organic from grass-fed cows that are hormone-free – modern milk is not the same milk your parents had in past years – it’s full of hormone and antibiotics used to raise cows in new modern factories where they get sick and die a lot more frequently and are milked while they’re pregnant which leads to 10X the estrogen of normal milk. Increase raw leafy green vegetables – eat a salad once a day for a meal – it will fill you up and take the place of a meal where you eat something a lot worse. Increase slightly steamed vegetables such as broccoli, cauliflower, cabbage, zucchini, and yellow squash. These will help fill you up – eat them first with a meal of chicken, fish, or beef. Eat only organic grass-fed beef and eat less of it. Most beef contains hormones, pesticides, GMOs, and more. Beef raised in feedlots produces beef that you just shouldn’t be eating nor should you be supporting that type of ranching. Eat only cage free organic chicken. Again, same as the beef. You shouldn’t support ranchers who are captives of big-agribiz companies who want to feed you chicken with hormones, insecticides, and GMOs. Avoid sugar and sugar-added foods. You might also consider avoiding minimizing fruit and fruit juices for a while. Sugar is just as much a contributor to your triglycerides as is grains. Choose healthier fats – stop using vegetable oils, corn oils, soy oils, for cooking – these are high in Omega 6 fats and too much of those fats can be devastating to your efforts to reduce your triglycerides. Instead choose olive oil, coconut oil, avocado oil. Believe it or not, cooking in butter will be better for you than cooking in the bulk vegetable oils. The key to exercise is to do things that are sustainable. If you workout with weights and do that regularly good for you but most people with metabolic syndrome and high triglycerides are not working out regularly so you need to find something you can do everyday and then build on that. Walking is one of the key ways I recommend when you’re just starting – walk around the block and make it your goal to do that daily. Once you’ve made that a part of your day you can increase the frequency to twice a day and increase the speed or distance, but first establish a foothold of daily walking. Naturally anyone would say they question how beneficial walking might be compared to other exercises, but if you’re currently doing nothing, walking is 100% better than no walking at all. Supplements are not a miracle cure for anything unless your body is just deficient in converting your foods to vitamins which is often the case as we get older. In particular, fish oil and niacin are the two recommended supplements for high triglycerides. As we get older it is also very likely that we’re not making enough vitamin D – a vitamin our bodies manufacture from exposure to sunlight – our skin has a form of cholesterol just under the outer layer that converts UV to vitamin D – a perfect little factory – but of course if we don’t walk outside and get exposed daily to sun we can’t really make that. Here are some good products I use personally. You really should take the time and watch a Bruce Lipton video. Now there are many different video-taped speaking engagements – he speaks a lot on the topic of epigenetic – the creation and maintenance of your cells – but this video is particularly clear and understandable and can empower you to understand how you can overcome things affecting your health. Well I’ve seen enough research to believe that as much as 80% of the risk for cardiovascular disease can be avoided through lifestyle changes – that is, changing what we eat, how we exercise (please read moderate exercise), and what environmental toxins we expose ourselves to. The search also shows that drugs such as statins and blood pressure medicines may reduce risk by 20-30% but that is not risk-adjusted for the mortality rate caused by the drug. So if you think that the body just gets old and heart disease is a forgone conclusion and nothing you can change – please think again. The body has all the mechanisms it requires to renew cardiovascular health itself if it is unencumbered by a person stuffing it full of bagels, cream cheese, and beer. The problem is that if you don’t make these lifestyle changes you’re sure to die a lingering death because medical science can keep you around long after you should have gone. And your family will mortgage their homes when faced with the terrible decisions brought on by your lack of attention to the only thing that could keep you from being a burden to your family. Everyday I seem to be talking to people over 60 or 70 that basically belief that what they have eaten all their lives has kept them healthy and they’re not going to change now. Sorry – that’s not really the truth – the truth is that your body was able to keep functioning in spite of all the things you threw at it, but after 60-70 years of dealing with those things, it gets worn out and can no longer convert crap to vitamins or eliminate toxins without complaining. Therefore all your experience with foods and lifestyle mean nothing at this point in your life. You have no experience that applies. Time to change. What are they? 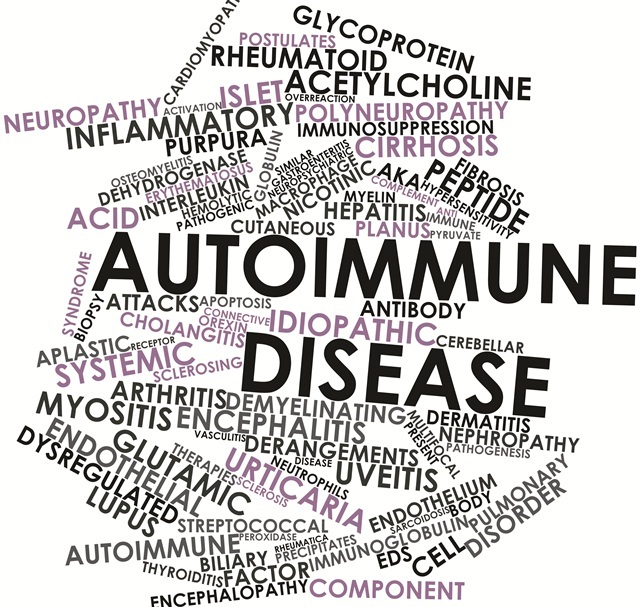 – the autoimmune diseases – what are the autoimmune disease symptoms? You must understand that there are two medical systems and they would answer these questions differently. Mainstream medicine believes that these diseases are incurable and often even that they are caused by aging and cannot be reversed but only slowed or managed by medication. Naturally these doctors are educated by the mainstream medical system and research funded by pharmaceutical companies. Food – food is medicine and the wrong food becomes the wrong medicine. Food that causes inflammation over time generates an imbalance in the gut where 80% of the immune system calls home. Chemicals – we use them daily for cleaning, and more. We also get exposed to them as we move from place to place outdoors. We also get exposed to them through our foods that are sprayed more than ever before in history and now genetically modified with organisms known to cause disease. Infection – we are exposed to a variety of infections and often we can suffer from infections whose symptoms we take as normal or something we just have to suffer through. Nutrition – our modern food chain has changed dramatically from days when we only ate whole foods to days when we only eat packaged or fast food. The chances that we’ll receive all the micronutrients we require are slim. Many of us suffer from Dybiosis – a dominance in our guts of bad bacteria vs. good bacteria – this means in part that we don’t derive the nutrients we need from our food as meager as that might be. As we look for the non-invasive treatment and try to gain early prevention, the following provide a comprehensive program. Scientists are reasonably sure that up to 40% of diseases have at their root autoimmune disease. In general, when it comes to root causes, there will usually be an equal number of undiagnosed autoimmune cases. Because autoimmune is a progressive condition, the symptoms can sneak up on us and fool us into thinking we are “simply getting older” until one day we wake up with symptoms that we cannot accept – that’s a little late in the cycle to decide to do something but it’s never too late. 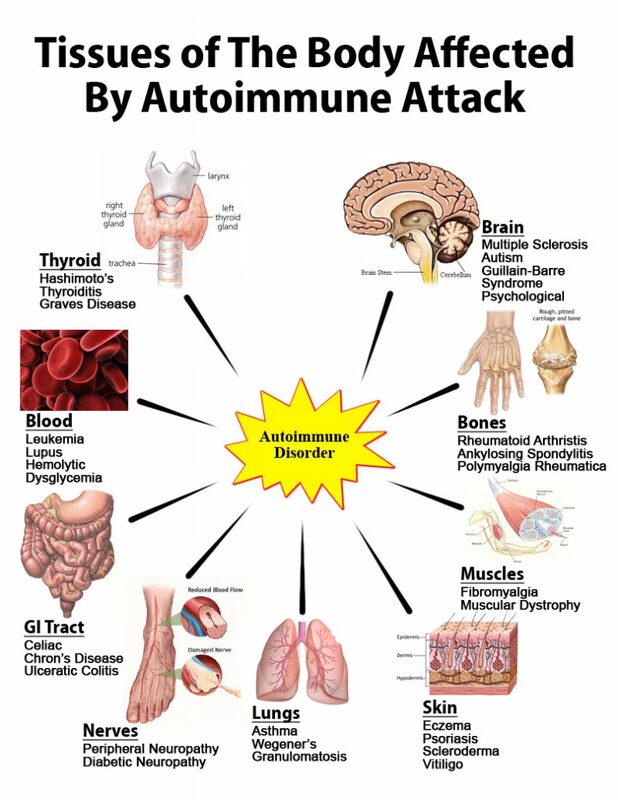 Autoimmune disorders are characterized by symptoms of the bodies immune system mistakenly attacking the body’s own cells or organs. This can show up as a number of autoimmune disease symptoms as shown in the chart. An immune system disorder characterized by dry eyes and dry mouth. An inflammatory disorder causing muscle pain and stiffness around the shoulders and hips. An inflammatory arthritis affecting the spine and large joints. Sudden hair loss that starts with one or more circular bald patches that may overlap. An inflammation of the blood vessels that causes changes in the blood vessel walls. An inflammation of blood vessels, called arteries, in and around the scalp. foods – foods that cause mild to severe allergic reactions. chemicals – exposure to chemicals in your environment. infection – a variety of infections such as oral infections associated with root canals, lyme disease, and fungal and bacterial infections that are often associated with sinusitis are just a few examples. It seems clear from the above list that testing is required to isolate the trigger(s) that might be causing the autoimmune disorder. Here’s one way to find a functional medicine doctor in your area. Self-Testing is another alternative. Here is a source for relatively low-cost testing tools.